Found on an island shaped by earthquakes and volcanos, the colorful Icelandic city of Reykjavik is home to the radically designed Hallgrimskirkja (Hallgrimur’s Church), Reykjavik’s iconic Lutheran church. Rising up from the hilltop Skolavorduholt in the center of the city, this church stands 250 feet tall and is visible from twelve miles away, dominating the skyline. 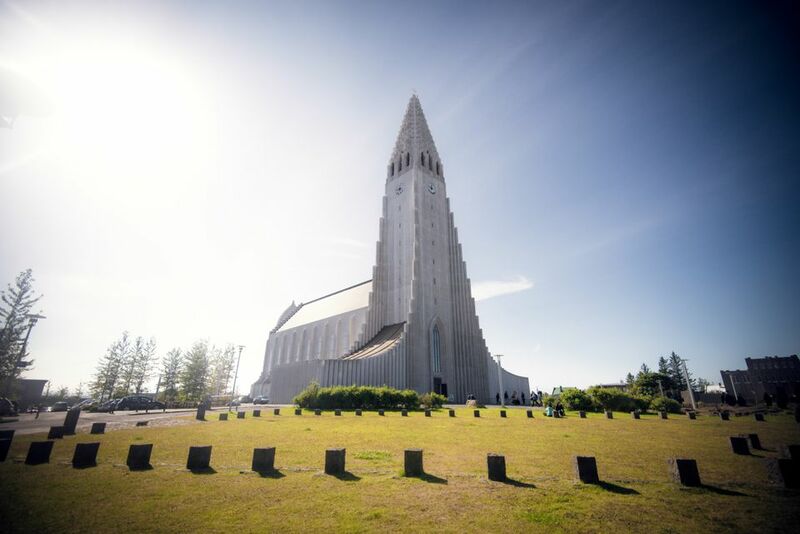 The church also serves as an observation tower where for a fee of 800 Kroner you can ride an elevator to the top for an unforgettable view of Reykjavik. All proceeds go toward the upkeep of the church. The steeple houses three enormous bells which are named Hallgrimur, Gudrun, and Steinunn. These bells are named after the reverend and his wife and daughter. The daughter died young. Hallgrimskirkja church takes its name from the poet and clergyman Hallgrimur Petursson who is known for his work Hymns of the Passion. Petursson is perhaps Iceland’s most revered poet and had a major influence on the nation's spiritual development. Designed by State Architect Guojon Samuelsson and commissioned in 1937, the church was imagined to resemble the mathematical symmetry of volcanic Basalt after it has cooled. Samuelsson also was the principal architect of the Roman Catholic cathedral in Reykjavik, as well as the Church of Akureyri and was strongly influenced by Scandinavian Modernism. Like his peers in other Nordic countries, Samuelsson wished to create a national style of architecture and strove to make the church look like a part of the Icelandic terrain, with the clean, minimalist lines common to Modernism. The interior of Hallgrimskirkja is in stark contrast to the outside. Inside you will find more traditional high-pointed Gothic vaults and narrow windows. In fact, according to Samuelsson’s earliest renderings, Hallgrimskinkja was originally designed to be part of a much larger and grander Neo-Classical square, surrounded by institutes dedicated to the arts and higher learning. This design had striking similarities with the senate square in Helsinki. For whatever reason, nothing ever became of this grand design. Construction on the church began in 1945 and ended 41 years later in 1986. Unfortunately, Samuelsson, who died in 1950, did not live to see the completion of his work. Although the church took years to complete, it was in use long before that. In 1948, the Crypt under the choir was consecrated for use as a worship space. It served in this capacity until 1974, when the steeple was finished, along with both wings. The area was consecrated and the congregation moved there, enjoying more space and additional facilities. Finally, in 1986, the Nave was consecrated on Reykjavik’s bicentennial day. The church also boasts the largest organ in all of Iceland. Made by German organ builder Johannes Klais, this massive instrument stands an impressive 45 feet tall and weighs in at an unbelievable 25 tons. The organ was finished and installed in 1992 and mid-June through mid-August, it can be heard three times per week, both in the lunch hour and also for an evening concert, for an admission of Ikr2000 and Ikr 1700, respectively. Leifer Breidfjord designed and crafted the main door to the sanctuary, as well as the large stained glass window above the front entrance. Breidfjord is also well-known for the Robert Burns memorial window in St. Giles Church in Edinburgh, Scotland. He also designed the decorations in and around the pulpit, symbolic representations of the Trinity, X, and P, the Greek initials of Christ, as well as the Alpha and the Omega. The church also owns a copy of Gudbrandsbiblia, the first Icelandic bible, printed in 1584 in Holar, Iceland. The parish of Hallgrimskirkja numbers around 6,000 and is served by two ministers as well as a number of additional deacons and wardens and of course, an organist. The church has a very full artistic and cultural life. There are pieces of art hung around the church, such as watercolors by Icelandic artist Karolina Larusdottir and paintings by the Danish artist Stefan Viggo Pedersen. The church choir is regarded as among the best in Iceland. Founded in 1982, it has toured Iceland and most of Europe. Outside the church there is a statue of the legendary Leif Eriksson, the Viking who is now widely believed to have been the first European to discover the American continent, beating Columbus by five centuries. The statue commemorates the millennial (1,000th) anniversary of Iceland’s first parliament and was a gift from the United States of America.